Apparently, Christmas is the season for sentencing – first and ex-governor and now an ex slugger. And once again, cartoons are the gift that keeps on giving. 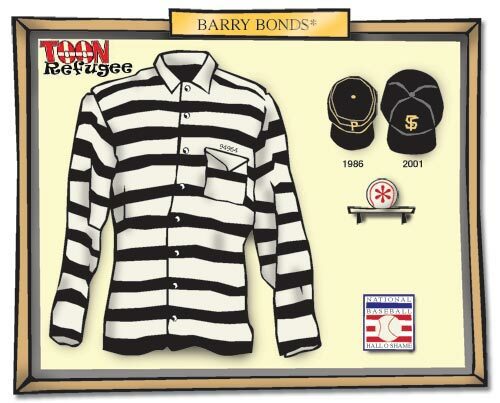 Here I’m recycling a cartoon from 2007 to mark the occasion of Barry Bonds’ sentencing for obstruction of justice. TOONrefugee humbly offers it’s exhibit design services to the Baseball Hall of Fame. His orange jump suit will have an easy access rear opening flap too! Say it ain’t so Barry. “Saying” it ain’t so is what got him into this mess!